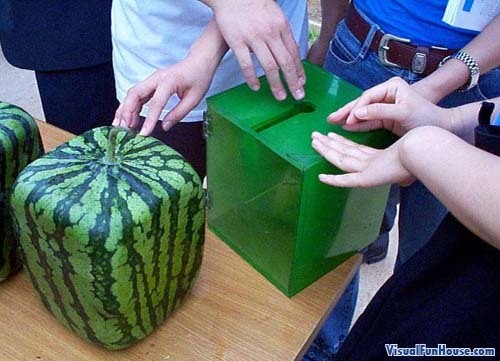 The Square Watermelon is not just an optical illusion, it has actually been developed by farmers in Zentusji a southern Japanese town. These watermelons are not just a marketing gimmick they serve a practical purpose as well. 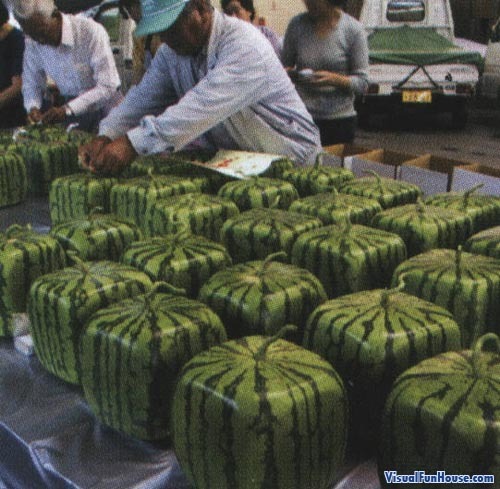 Japan is a very populated country that lacks space, these square watermelons are the perfect spacing shape and make it convenient for shipping. The watermelons were growing in square tempered glass containers that house the watermelon on the vine and and aid them in shaping them into a perfect square. There is no more awkward stacking of round fruit, this is the ultimate space saving watermelon!